Much of Latin America contains abundant natural resources, such as minerals, gold and oil. While we may expect this to be a windfall for Latin American people, it can all too often have the opposite effect. Although the days of colonialist exploitation of these resources may be over, many of its features – being forced to work long hours for little or no pay in hazardous conditions, the exportation of this mineral wealth to the rich countries of the Global North, and the pollution of ground, air and water – remain sadly much the same. Yet as this is a problem that is shared across much of Latin America, many vibrant movements have sprang up in protest, working in solidarity with each other, and with the support of other organisations around the world. The extraction of these resources often has hugely negative effects on the local environment. In Ecuador for example, vast swathes of the Amazon rainforest have been irreparably damaged by oil, spilled by reckless foreign companies. Toxic chemicals such as cyanide are often employed in mining operations, which frequently leeches into soil and water. Air pollution is another huge concern. 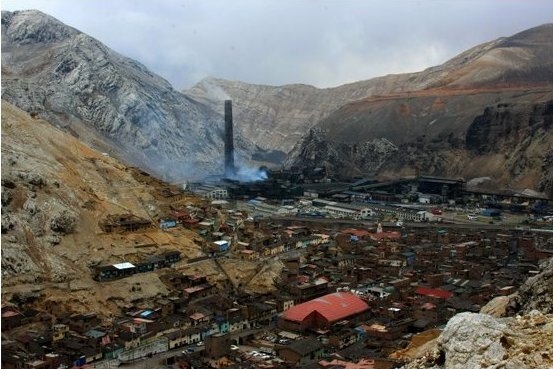 In one mining town in Peru, La Oroya, 99% of children were found to be suffering from severe lead poisoning, making this small Andean town of 35,000 one of the world’s most polluted places. Although mining and drilling may provide some local employment, it is temporary, non-sustainable, and devastating to more traditional and dependable forms of employment such as farming or fishing. While the firms responsible for these abuses may accrue massive profits, these are almost never seen by the affected communities, who are instead forced to bear the costs of this exploitation. Smelting and mining operations by the American Doe Run Company have turned La Oroya into a toxic wasteland. Photo by Darío Torres. 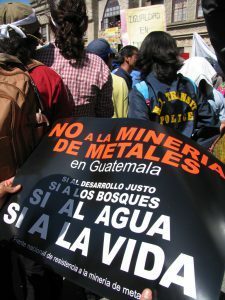 Mining and drilling operations often take place in indigenous areas, with little to no government safeguarding of local rights. In fact, roughly half of all gold mined comes from these native lands. Operations often go ahead without securing the consent of those living and working in the area, and local people can face eviction and displacement from their homes with no guarantee of compensation. As new technologies develop for the extraction of these resources, governments are increasingly allowing extraction in previously protected areas of high conservation value. One such area under threat is Ecuador’s Yasuni reservation, where one hectare of forest can contain more species of plants and animals than exist in the entirety of North America. Mines are particularly hazardous for workers. Although miners compose just 1% of the world’s labour force, they account for 5% of workplace fatalities, due to hazards like rock falls, tunnel collapses, gas leaks, fires, and exhaustion. Even outside the mines, workers face drastically reduced life expectancies. Due largely to conditions like silicosis, bronchitis, and lung cancer, the life expectancy of a Bolivian miner is 35-40 years, well below the national average of 70. In a story familiar to many Latin Americans, worker’s rights have often been left by the wayside, and attempts to unionise are often met with fierce repression. In Colombia in 2001, eleven members of the Metals, Mining, and Oil Workers Union were assassinated by far-right paramilitaries with ties to mining companies. LASC has been a longtime supporter of those affected by mining, alongside many other incredible organisations. LASC is proud to take part in the No Dirty Gold campaign, raising awareness of the impacts of mining on communities worldwide, and tackling mining conglomerates head-on. 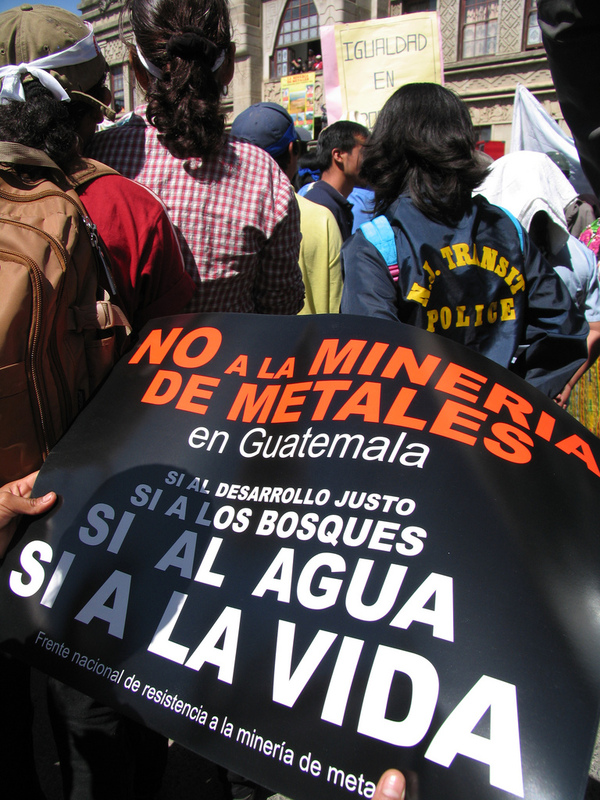 In 2004 and 2013 in particular, LASC focused on the mining issue, inviting speakers from Guatemala, Colombia, and Peru to share their experiences as part of our Latin America Week. Through these events, and others, LASC sought to challenge our perceptions on what constitutes wealth, our relationship to the earth, and the role we all play as consumers. We invite all of you to join this global movement, and pledge to avoid dirty gold.